As well as the weekly beginners classes held at Fitness Republic in Ashby De La Zouch we also hold specific &apos;Beginners Introduction to Aikido&apos; courses across the year for anyone 16 or over. Our next course will start on Monday 9th September. Please contact us by e-mail: ShiroKashiAikido@Gmail.Com or Phone: 01283 210 533 for more details and to book your place. The course will provide you with a realistic opportunity to experience aikido for yourself, as well as providing a good grounding for continued training. In addition to forming the basis of your training, it also offers you the chance to train with other newcomers & make new friends, which has proven to be very useful when starting (& continuing) on the path of aikido. If you can&apos;t wait for the next beginners course, you can simply turn up and train at any of our regular Monday night classes at Rickmans corner . The only difference is that regular classes are not solely aimed at beginners. After an initial warm-up, the sensei (teacher) demonstrates techniques to the class who then partner up & practice that technique. Aikido is not competitive. You work with a partner to develop an understanding of the movements, both how it feels to perform & to receive the techniques. Be sure to advise the teacher of any medical problems, injuries or physical limitations which should be considered for your own safety and that of the other students. Basic aikido techniques: taijutsu (empty handed techniques) - how to perform & safely receive basic attacks, locks, pins & throws. An introduction to aiki weapons: jo (wooden staff) & bokken (wooden sword). You should wear light but reasonably robust clothing, such as a sweat shirt & jogging bottoms. We train in bare feet but footwear should be worn whilst off the mats to avoid bringing dirt onto the training area. A karate or judo-gi (the familiar white costumes worn during training) can be purchased later if you decide to continue your aikido training. 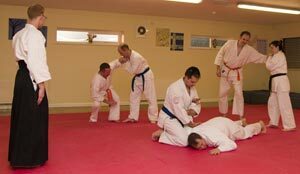 At the end of your course you will need to decide whether you'd like to continue with your aikido training or not. If you do wish to continue you will need to become a member of the club. Membership costs £35 p.a. Come along & watch a class before you commit to parting with your hard earned cash. We're more than happy to welcome spectators & answer any questions you may have...just pop along on one of our club nights (excluding Bank Holidays). Please aim to arrive 10-15 minutes before your first class to allow time to register for the course. 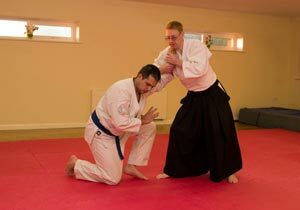 When signing up for the Beginners Introduction to Aikido , you are enrolling on a course of study. Sorry, but refunds are not offered for classes that are missed. Students must be 16 or over.